Back in the late 1990s, independents were in danger of vanishing. Large publishing houses were swallowing up indies and medium-sized presses to create corporate publishing houses. The idea of being on an independent publisher’s books was scoffed at – that way lies penury and obscurity. Last year four independent publishers made it onto the Man Booker Prize list. The independents aren’t just coming, they never went away. Today they are at the forefront of discovering new talent. Consider this: Norfolk-based Salt Publishing discovered Carys Bray and picked up Alison Moore’s spellbinding novel, The Lighthouse; Seren Books in Wales published the Costa and Booker-long-listed The Last Hundred Days by Patrick McGuinness. In Hebden Bridge, Bluemoose Books is championing new writing to a global audience. It published King Crow by Michael Stewart, winner of The Guardian’s ‘Not The Booker‘ in 2011 and a recommended read for World Book Day 2012. Adrian Barnes’s Nod was long-listed for The Commonwealth Writers’ Prize 2013 and short-listed for Europe’s biggest Science Fiction prize, The Arthur C. Clarke Award in 2013. Last year it was published in North America. Bluemoose’s latest success story is Benjamin Myers, long-listed for The Jerwood Prize in 2015. Last November he scooped the £10,000 Portico Prize, the North’s leading literary award. Penury and obscurity are no longer on the cards for writers who embrace the independents. 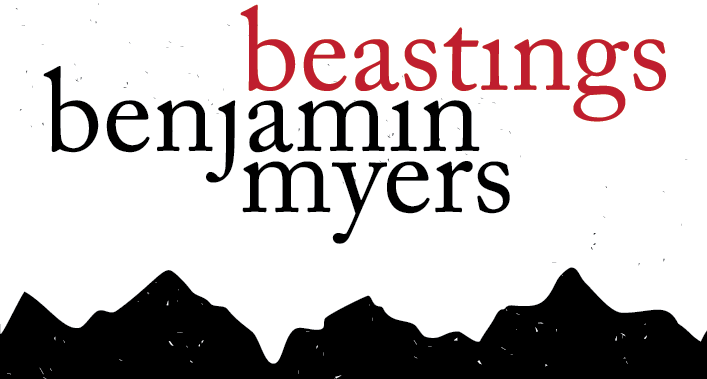 I talked to Myers about his award-winning novel Beastings, why he walked away from a big publishing house, and the importance of the desire to write over the economics of being an author. Andrew Oldham: The fells of Cumbria become a living, breathing character in Beastings akin to the moors in Wuthering Heights. However, as in the Brontë novel, nature is black, something that can cosset or destroy. Did the characters in the novel become an extension of this or did the characters come first and the landscape afterwards? Benjamin Myers: The desire to write about the Cumbrian terrain came first, as it’s a place that’s close to me. I first climbed Helvellyn when I was five and have been walking there every year since. So Beastings began with the image of a solitary figure moving through the landscape, and the landscape moving through her too. It began with rain and rock and cloud and hunger and sweat and desperation. Flight. I wanted to write something where humanity and landscape almost become interchangeable, so that the reader is left wondering which is crueller – the timeless elements and hewn mountains that conspire to kill or the people – a cruel priest, a poacher – who are in pursuit of the girl whose journey we follow. I’d describe it as a morality tale. I wanted it to be largely free of references to time, place and era – a story that could almost work just as well in the Tundra, the desert, the rainforest or the outback. I just happened to write about the places I know best, the darkening North lands. AO: The idea of time is played with, it is clear that we are not in the present day due to an absence of technology and the Church actively taking in female waifs. This lack of time seems to be at the centre of the female protagonist who tries to piece together her early days on a hill farm, her possible imagined future and her desperate present. I wondered why you chose to use time as fluid form, juxtaposed with a pursuit by the priest who is obsessed with time running out. BM: I think it can be viewed as fluid. I’ve always been fascinated by the idea of ‘time’ as something that has had a numerical structure imposed upon on it – seconds, minutes, hours, days, weeks and so on. These are all human inventions, and relatively recent ones in the grand scheme of societal evolution. This makes me wonder how people viewed time before these systems were in place. On a more practical level, whatever I write is concerned with brevity and pace. Beastings was edited down through seven different versions, each one chipping away at it in order to create some hewn and immoveable, like a big slab of Cumbrian rock. I took all the commas out so that the reader hopefully feels like they are being dragged along as the nameless child is dragged along, their breath held in their throat, their pulse quickening. That, ultimately, is the aim of my prose, to provoke a heightened heart rate or tears or nausea or overwhelming feelings of love. If the reader feels like they are there, battered by the elements, then I would judge the book a success. If they feel nothing, then I have failed. AO: The characters of the priest, the poacher and the girl seem representative of the brutality and beauty of the landscape. They appear to be a metaphor for the Holy Trinity. How much did the idea of faith versus religion play in creating the three characters and the landscape they inhabit? BM: I’d never considered the Holy Trinity metaphor but it’s a keen observation. I’ll take it. I’m a believer in things rising from the subconscious and onto the page, so perhaps this is an example of that. Faith and religion are, as most right minded people are probably aware, two very different things. I think there are grey areas between the two, crossover points, but I think that faith is always more powerful than religion. Faith is beyond corruption, whereas corruption is often the prevailing currency in religion. Beastings wasn’t really written as anti-religious piece at all, but more of an attempt to show how it can intoxicate the individual to such an extent that they lose all moral sense. That is evident in the priest who is essentially ruled by appetite and power, whereas the girl is fuelled by faith in a better future. The landscape meanwhile is, hopefully, impartial. Mountains and rivers don’t care about religious doctrines, dogma or philosophical quibbles. They’ll outlast us all, I hope….